These gluten free brownie cookies have all the richness of brownies in a soft, chewy and tender cookie. They’re made without chocolate chips because they don’t need them! It’s not like you can’t make brownies or anything. But I am a cookie person, through and through. I play it cool for most of the year and mostly break out the cookie recipes in December. But really? I’m making cookies all year. I actually really love the texture of crispy cookies, but that’s mostly in the abstract. A soft, chewy cookie like our thin and chewy chocolate chip cookies? Those really have my heart. The best way to make any chocolate recipe as rich as can be is by adding both cocoa powder and melted chocolate to the batter. Together, they add deep chocolate flavor, and with the right balance of other ingredients, the perfect texture. 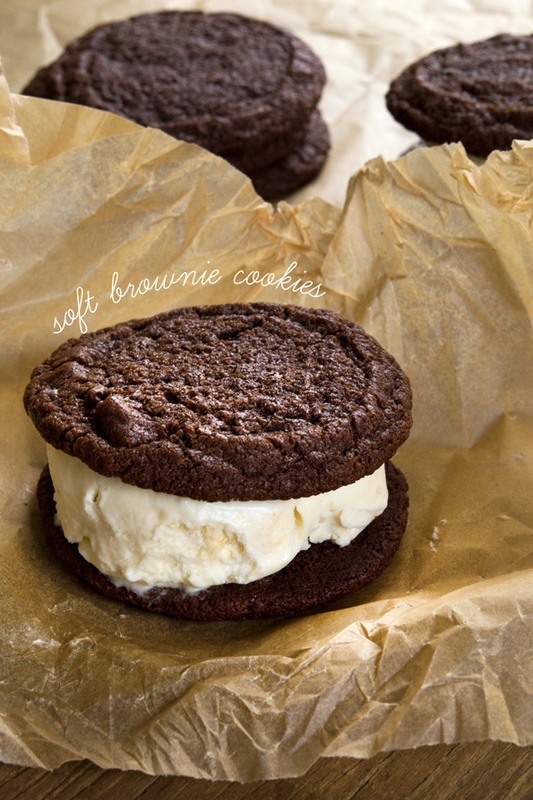 If you need an excuse to make these brownie cookies (or really any soft and chewy cookies) when the weather is warm, too, you should know that they have the perfect texture for making ice cream sandwiches. 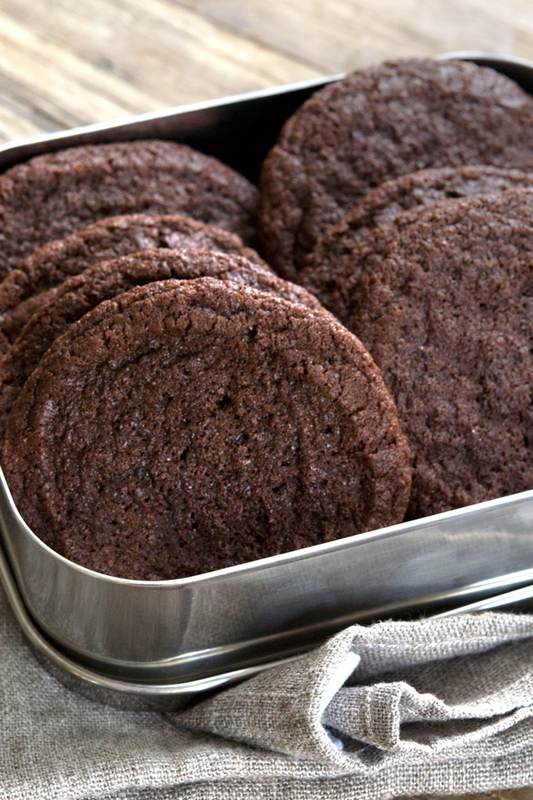 These brownie cookies are soft, thin & chewy (not to mention that they taste like brownies dream of tasting). Ever try to bite into an ice cream sandwich made with crunchy cookies? The cookie splinters and, well, you look like a dork. Once you have the proper cookie, just be sure that the cookies and the ice cream are at the same temperature during assembly. The dough for these cookies is very, very soft when you first make it. You can pull off pieces of dough, roll them into rounds and then press into disks. The dough shouldn’t be cold before baking, and can even be baked right away. I prefer to make the dough sliceable by chilling it in a cylinder. That way you get nice, even circular cookies. You’ll want nice, big slices, each about 1/2-inch or less. Just rock the cylinder back and forth a bit on the counter before slicing if you think the dough isn’t nicely round. If you’d like smaller cookies, just make the cylinder longer and thinner, and slice the dough the same. When I’m going to be including the cookies in my end-of-year giftable cookie boxes, I tend to make them smaller so I can fit more types of cookies in each box. Click play ▶️ to watch me make these simple slice and bake brownie cookies. Then, it’s your turn! And scroll down for information on ingredients and how you might be able to make substitutions if you need to. As always, unless I specifically state otherwise, I haven’t tried this recipe with any of the following substitutions. They’re just my educated guesses! Dairy-Free: I’d try Spectrum butter-flavored nonhydrogenated shortening in place of butter in this recipe. Just make sure the bittersweet chocolate you use is dairy-free, too! Egg-Free: I’d go with my standard “chia egg” substitution (1 tablespoon ground chia seeds + 1 tablespoon lukewarm water, mixed and allowed to gel) here. It should work fine since there’s only 1 egg. In a medium-size bowl, place the chopped chocolate and chopped butter. Melt in a double boiler or in the microwave in 30-second bursts, stirring until smooth. Allow to cool briefly, and then add the molasses, egg, and sugar. Mix to combine, and set the bowl aside. In a large bowl, place the flour, xanthan gum, cocoa powder, salt and baking soda, and whisk to combine well. Create a well in the center of the dry ingredients, and add the chocolate mixture. Mix to combine. The dough will be very soft. Transfer the dough to a large piece of unbleached parchment paper. 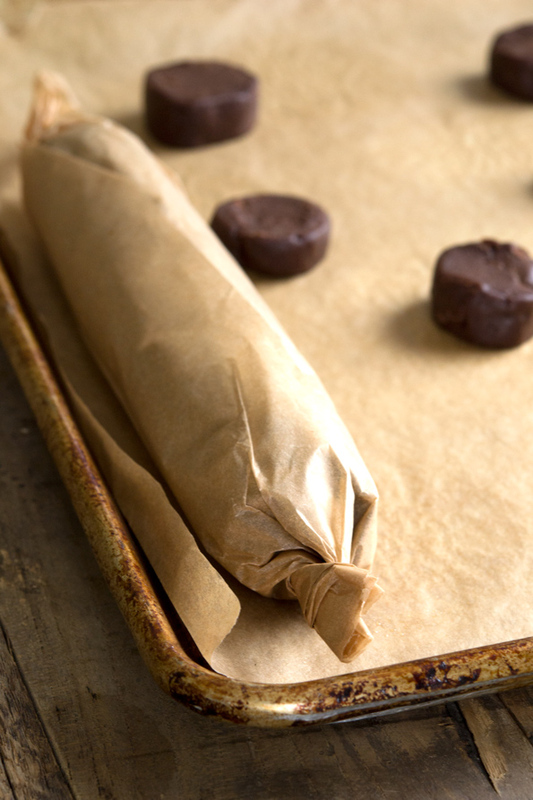 Shape into a cylinder about 2-inches in diameter along the length of the parchment paper and roll the paper tightly, cinching the ends to seal. Place the cylinder of dough in the refrigerator until firm enough to slice (at least 1 hour). Once the dough has chilled enough to be sliced, preheat your oven to 325°F. Line large rimmed baking sheets with unbleached parchment paper and set them aside. Remove the chilled cylinder of dough from the refrigerator, unwrap, and slice into 1/2-inch thick disks. Place the pieces of dough about 3 inches apart on the prepared baking sheets. Bake, one baking sheet at a time, in the center of the preheated oven for 12 minutes, or until the cookies are spread about 3 inches in diameter and are set in the center. Remove from the oven and allow to cool completely before serving. If you attempt to move the cookies before they are cool, they will fall apart. Originally published on the blog in 2013. Recipe unchanged, some photos and video new, text mostly new. We just finished all of our cookies. They were delicious! Just one thing I changed, I didn’t have molasses, so I added the zest of a whole orange for flavor. I know these don’t substitute each other, so I’m pretty sure my texture was off, but it had a lovely flavor though! Reminded me of the chocolate oranges we ate during the Christmas season in my childhood. Thanks for the wonderful recipe! They’re definitely quite different without the molasses. It’s actually a very important ingredient to make these. These are my hubs favorites. For our holiday party I make them with peppermint /vanilla extract. Add some chopped white cocolate and finish with crushed candy cane pieces. They are so amazing. And everyone’s favs! That sounds amazing, Heather! I have a terrible fondness for crushed candy cane pieces on holiday cookies. I can’t get molasses locally, what would be a good substitute? My daughter is drooling at this video and is very keen to make these cookies with me! That’s kind of rough, Ruth, since the molasses really gives these cookies a lot of flavor. If you’re in the UK, Lyle’s will serve the same chemical function, but won’t replicate the flavor. Can you please tell me what quantities of the flours do you use and which ones to make a gluten free flour mix. Yea I’m with the other person here mine did not spread at all! Erica, Sherri’s substitutes are the reason her cookies did not spread. 8 tablespoons of butter and only 1 1/4 cups of flour, and these cookies will spread. Wow! 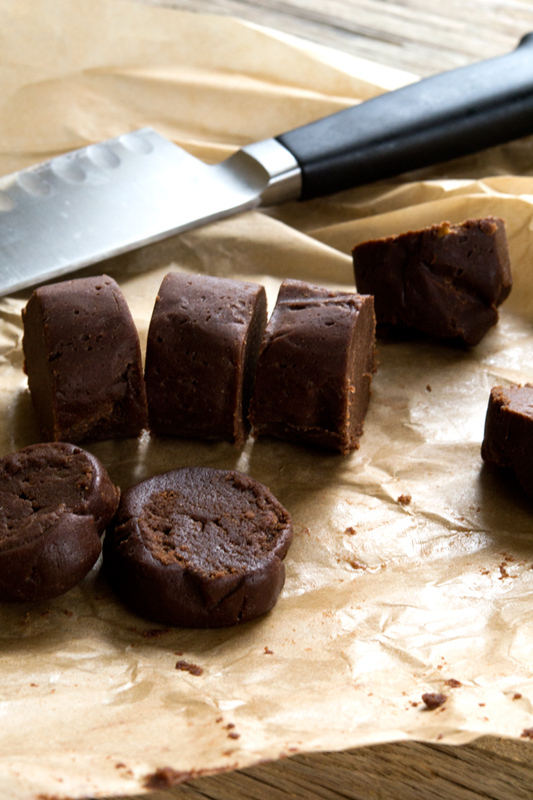 These cookies are soft, fudgy and definitely satisfy a chocolate craving! My butter subs worked fine, except my cookies did not spread as well as yours, and instead of thin and chewy, mine are plump and soft. Like I said, very tasty, but not ideal for ice cream sandwiches, I will keep experimenting. Looking good for a holiday! Quick question for you, what is a cup of Dutch process cocoa in grams for your recipes?? I’m backfilling in book 1 for me (or is it my?) and my family’s eating pleasures. Hey, Jennifer! 1 cup of Dutch-processed cocoa powder (in my recipes, at least) is always 80 grams (5 grams per tablespoon). I love that you’re doing that! I wish I had included corresponding weight measurements in Book 1. I was scared that it would freak people out! If there’s ever another edition….